Sailing is What We’re All About! If you’re an experienced sailor, we invite you to use one of our sailboats included in your cottage rental at no additional charge. There’s no better way to relax and enjoy the Keys. 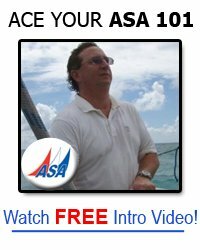 Plus we have an onsite American Sailing Academy (ASA) Sailing School to advance your sailing, or you can just get a taste of sailing with our 2 hour Intro to Sailing. Our sloop-rigged 22’ Catalina sailboats are perfect for cruising the calm waters of Florida Bay. Just grab your cooler, walk to our dock, and point the bow at the horizon. We offer approximately 30 square miles of bay side surface to sail, which includes no less than 3 specific destinations with straight runs of up to 6 nautical miles – one way. 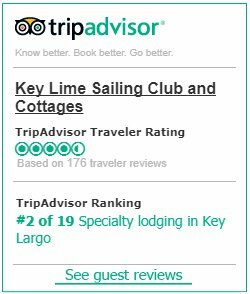 All of our sailing area is within the confines of the Florida bay, Everglades National Park and parts of the Florida Keys National Marine Sanctuary. Florida Keys National Marine Sanctuary protects 2,900 square nautical miles of waters surrounding the Florida Keys, from south of Miami westward to encompass the Dry Tortugas. A thorough brief and chart orientation is given the morning after your arrival, followed by a walk-through familiarization with the boat you will be using. You must be able to confidently handle the vessel; if you have any doubt as to your ability, please contact Cap’n G to discuss your maritime experience. We offer a variety of instruction options that can be tailored to meet your specific needs. In Florida, anyone born on or after January 1, 1988, who operates a vessel powered by 10 horsepower or more must pass an approved boater safety course and have in his/her possession photographic identification and a boater safety identification card issued by the Florida Fish and Wildlife Conservation Commission. Wanna get your Florida Boating Safety ID Card but don’t want to pay $29.95? We found a place you can get it for free in this website. A person is exempt from this requirement if there is a person on board who is not affected by this law or is at least 18 years of age and holds a boater education I.D. card. This person must be attendant to and take responsibility for the safe operation of the vessel and for any violation that occurs during the operation. To our guests that will be using our 22′ Catalinas, this is not a requirement. But we highly encourage you to study and take the test because it will help sharpen your knowledge about boat safety. The site also offers other interesting boating-related courses that you can complete at your own pace. Our in-house guests get priority (free!) use of our sailboats, but on a case-by-case basis, we do offer boat rentals for only $250/day + tax. Just call when you’re in town and we’ll see if we can help with your sailing needs. Are you a local or frequent visitor to the Keys? Our Skipper’s Society is the low-stress alternative to owning your own boat. You don’t have to worry about maintenance, insurance, stepping and unstopping the mast, trailering or slip rental! Members are guaranteed at least 5 days’ sailboat use each month, and if availability permits, extra days can be booked for no additional cost. Other membership benefits include discounts on sailing lessons, special cruising events, and privileges enjoyed by our in-house guests. Custom 40′ Catamaran with water slide. Oh Yeah! Water Bird is one of our fastest 22′ Catalinas.